What kind of event can you paint? I can paint almost any event. 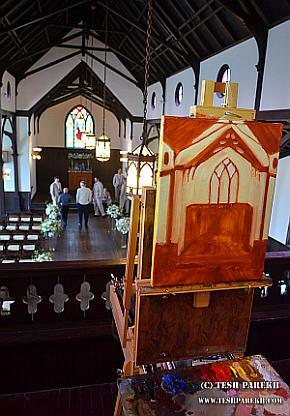 For weddings, I am usually requested to paint ceremony, reception, or both. 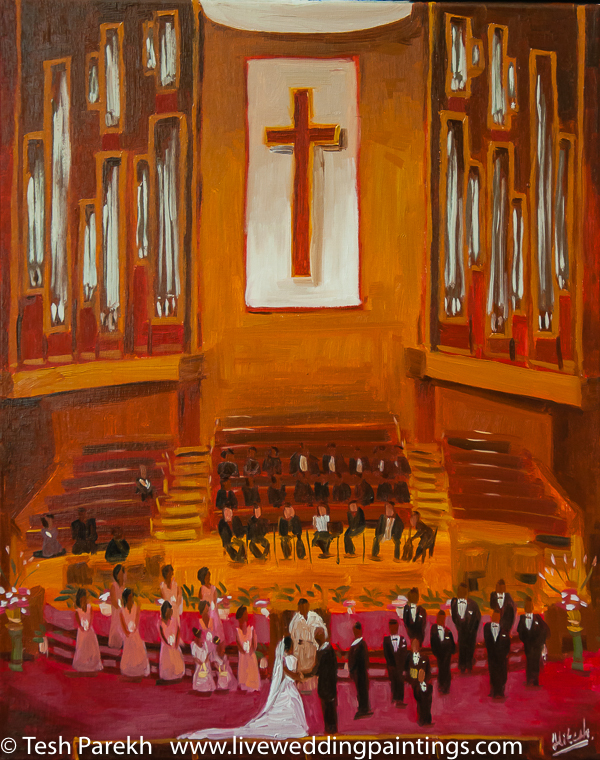 Should I commission a Ceremony painting or a Reception painting? This is a personal choice: I am happy to paint either (or both). 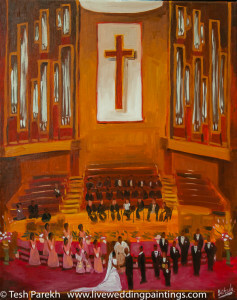 For ceremony painting: focus is on the couple, venue/ background and the wedding party. For reception painting: focus is on the couple, venue/ background and some of the reception elements. What mediums do you paint in? I offer the choice of Oil (on linen canvas) or Watercolor (on paper). Oil being the classical painting medium of the Old Masters. Should I commission an Oil painting or Watercolor painting? This is a personal choice: I am happy to paint in either medium (I love both!). Oil painting: ideal for both indoor/ outdoor weddings, framed without a mat & glass, takes few days to dry and is richer in colors. Watercolor painting: ideal for indoor wedding, framed with a mat & glass, dries on location and is subtler in colors. Will there be details on the faces? Recently, I have been receiving requests to paint facial details on the couples. So, I do paint the details to the extent possible: my aim is to maintain overall likeness. Unlike studio portrait commissions, exact likeness and fine details on the faces are not possible in live painting. Also, facial details on the wedding party and guests may not be possible, but, I do incorporate suggestion of the details whenever possible. I take reference photos during the event to make this possible. How long does it take to finish the painting? The total time depends on the type of event, painting medium and size of the painting. Normally, 5-6 hours or even longer (although I also paint in very short time frames when needed). I start before the main event. I paint in the background first. I sketch, take reference photos and paint through the main event. I finish painting before the end of the event. The finished painting can be displayed on an easel! This is different from other live painters who start the painting on location and then finish it in their studio. My live paintings are truly “live”. What is unique about your particular service? My live paintings are truly “live”: started and finished at the event! What painting sizes do you offer? Pricing is based on location and size of the painting. I am based in Raleigh, NC and will travel to almost any destination. Please fill out my contact us form and I will connect with you within 48 hours of receipt.